This po se is often performed in a sun salutation. 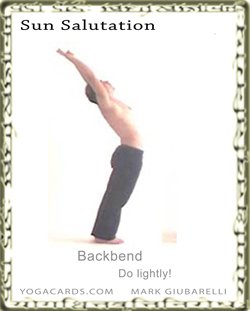 It is the first backbend in the sun salutation. The tilt can be done lightly or not at all. It can also be done much deeper. This motion is done with an inhalation usually. This allows it to blend well with the following pose which is an exhalation into a forward bend. The arms can be stretched forward or they can be stretched up and round in a circle. There are many creative ways to flow up with the arms. The legs are usually together but can be apart up to hip width apart. Create space in the lower back. It is easy to just let the spine crush backwards so always create a little lift by engaging core. If you engage core too much (Deep stomach muscles) the backbend come to an abrupt stop. The inhale can create pressure all of a sudden in the mind. This is due to the lung compressions after an inhalation. The lungs have less room and the air has nowhere to go. To prevent this breathe in during the backbend but not as deep as possible. Leave a little space in the lungs to reduce the pressure. A little pressure is good and delivers the oxygen to the lungs well but too much causes pressure and energy buildup in the body and mind. This exercise stretches the lower back. When done lightly it is really healthy. When performed deep and it can aggravate injuries or in many cases cause repetitive injuries and inflammation in the lower back. Injuries This pose is quite hard on the lower back so enter a mild backbend if any when you have a lower back injury. Look at the pictures below and perform the easier one. From Tadasana step the legs apart. Turn one leg out and bend the knee over the ankle. From Uttanasana step one leg back and externally rotate it until the heel touches the mat. From the Downward Dog Pose step one leg forward between the hands. Externally rotate the back leg until the heel touches the mat. It can be hard on the back if injury is present and this yoga position is entered too fast or too deep. It can also be a vary therapeutic yoga position when done mildly. Examples of a little and a lot. The tilt back can be a little unhealthy if your discs are worn down or you have any kind or repetitive injuries back there due to over use of supporting muscles. You can always just tilt back a little. This way you can still do yoga Sun Salutations but not harm or aggravate a condition. Engaging core will prevent a tilt. It may be better to try to raise up so that you spine lengthens and creates space in the lower back.